When we have to make calls on the daily basis, we always have a fear of spending too much on daily mobile usages unknowingly. Customers always want to get most out of mobile services at low cost. It’s hard to find a perfect bundle or package when you do not make calls or use the internet frequently. When you are in immediate need of making calls, sending SMS or surfing the web, then daily packages can help you out. Some daily packages come with all services bundled together for ease and convenience of users. Usually, users have fewer options regarding daily packages. Some packages offer only free calling minutes, some come with unlimited SMS, and some has free data Mbs for you. So, what can you do if you need to enjoy all these services by subscribing and paying once?? 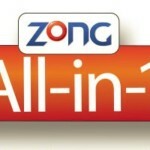 Don’t think much because Zong All in 1 daily bundle is the answer to all your problems. 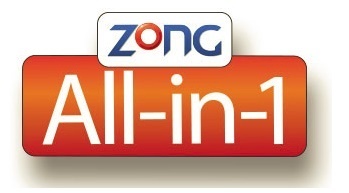 Zong has introduced its All in 1 package for those prepaid users who want to have hybrid bundles. Daily all in 1 bundle is best among all the categories of this offer because you can enjoy more by paying less. Read on to get the details of the offer. Subscribe to all in 1 daily bundle at possible low rates. Enjoy calling on on-net as well as off-net numbers, SMS on all local networks and free data Mbs for all internet users for just Rs 20 + tax. No additional or extra charges are included in this offer. You can subscribe to all in 1 daily bundle by dialing *6464#. A menu will appear, select all in 1 bundles by pressing 3 and after choose 1 to activate the daily offer. You will get a verification message from Zong which will confirm your subscription. Get 40 Zong to Zong minutes for free talk time with on-net friends. To make the call on other networks, you will have four off-net minutes. Access the internet with 40 data Mbs. To enjoy chat, you will be provided with 400 SMS on all local networks. This offer is valid only for pre-paid customers of Zong. Call set up charges of Rs 0.15 + tax will apply. All in 1 bundles are auto-renewable and get renewed at midnight of the subscription day. The offer is valid only for a day. Charges as per package plan will apply to the consumption of resources or expiration of package. FED and other taxes will apply according to company terms and conditions. To unsubscribe the all in 1 daily bundle, just dial *6464# and then press 4 for all in 1 bundles, the reply will daily bundle and then press 3 to unsubscribe. You will receive a message of un-subscription1. The offer will also expire at midnight if you don’t have sufficient balance. Zong is providing you the opportunity to enjoy all services at minimal rates. So, Subscribe to all in 1 daily bundle to get what you want and to enjoy unlimited fun.